I am not much of a reader. I tend to like non fiction. But, I have read a few really good novels over the past few months. Quo Vadis, by Henryk Sienkiewicz. I loved this book. It is almost impossible to describe it. It is a fictional novel set during the reign of Nero. It's a story of war, faith and love. Quite an epic, and I loved every page. The Pillars of the Earth, by Ken Follett. At over 900 pages, this book was more than a little intimidating to me. This novel is about a master mason longing to build a cathedral during the Middle Ages. Doesn't that description make you want to click on over to Amazon and buy it? Of course, it's not just about "Tom Builder". It's about war, faith and love. Hmmmm. I'm seeing a pattern here with Briana's book choices. But, these 900 pages flew by. One of Briana's blog friends over at "The Empty Sky" has a link to a list of books. So, I clicked on that link one day. This led me to my next book, The Boy Who Loved Anne Frank by Ellen Feldman. It is a fictional tale about what might have a happened to Peter, the boy who was also hiding in the secret annex in Amsterdam during WWII. Peter survives the horrors of the concentration camps and eventually moves to America. How he reacts to the publication of Anne's diary is quite compelling fiction. After these three novels, I had to return to my love of "real" books. So, I picked up Another Day in the Frontal Lobe: A Brain Surgeon Exposes Life on the Inside by Katrina Firlik. Despite the fact that the author comes off a bit arrogant (what doctor doesn't), I still enjoyed the anecdotes about her residency, her patients and her absolute passion for that part of us that makes us who we are: the brain. 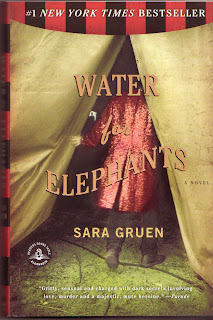 Back to the novels, I took Lisa's advice and just finished Water for Elephants, by Sara Gruen. I loved this book. It's one of those books that you just don't want to end. Ninety year old(or 93, he's not sure), Jacob tells the story of his life in the circus during the depression. Briana also wants to thank you Lisa for this recommendation. She loved it as well. My favorite line from this book? "Keeping up the appearance of having all your marbles is hard work, but important." A lesson I need to learn, I think. Maybe if I keep reading, I can keep up the appearance I have all my marbles. Yes, Water for Elephants is one of my favorites now. Lisa, that was definitely a great recommendation. Any others? I'm thirsty for more good books. I'm currently reading The Time Traveler's Wife by Audrey Niffenegger. Pretty interesting. And contrary to the other books I sent Kathy to read, this is NOT about war. But it is about love. Really curious to know who you guys are casting for the movie....Tom begrudgingly took my advise and read the book as well. He also loved it. Sara Gruen has written two other books. Have one but haven't started it yet. Since the Elephant book I haven't been satiated, each book I have read has paled in comparison. The Peter book sounds great! Think it will be my next read. Thanks you two for the suggestion. I really have no recommendations, but there is a book I am interested in reading. It is about 2 "Madam's" in Chicago. It is non-fiction. I heard the author interviewed on NPR a couple of weeks ago. This week Entertainment Weekly had a blurb about the book, and the person recommending the book was none other than the author of the Elephant book. Still curious about your casting decisions for the book.